The seven solid titanium plates on the Chanson VS-70 are nano- plated with platinum, which provides the highest level of conductivity and durability. The cutting edge design and proven durability of electro-plated platinum ensures you get the best ORP (Oxidation Reduction Potential) alteration and functional durability year in year out. Most machines on the market can only make strong acid and alkaline water by adding salt or slowing down the water flow to a drip. The Chanson VS-70 can make alkaline water as strong as 11.7 pH and acid water as strong as a 2.4 pH at full water flow, as with other machines it will also produce even stronger waters with reduced water flow. The first machine that can be fine tuned for YOUR water quality! The Total Dissolved Solids (TDS) in water can vary greatly from area to area. Because of this difference in source water, an ionizer at the same alkaline settings will produce different alkaline levels; filters in different water quality conditions will have different filter life and self-clean in different water quality conditions will have a different frequency of self-cleaning. Once the ionizer is adjusted to your TDS level, the Chanson VS-70 will maximize its alkalinity, acidity, the cleaning cycle, and filter life for your water! We guarantee top value and lowest price! We guarantee you won't find a lower price on the internet and if you do we will match it or beat it! •The very valuable acid water can assist with skin issues among many other uses. •Surfactant effect (makes water wetter) increases by around 100%. •Negatively ionizes water and adds hydroxyl ions to the water. •Electro-plated faucet adds elegance to your kitchen. •Voice message in multiple languages to select from or play beautiful piano music. The water supply can vary greatly from state to state and county to county. 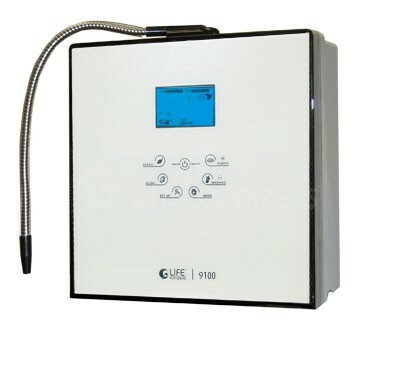 Because of this difference in source water, an ionizer at the same alkaline settings will produce different alkaline levels; a filter in a different water quality condition will have different filter life; self-clean in the different water quality condition will have different frequency of self-cleaning cycles. Chanson water ionizer can auto-adjust "the remaining water filter life" and "time of self-clean" according to your water quality. 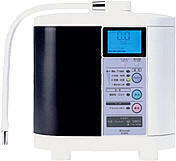 You will have your own personalized water ionizer settings. •Adjusts the electrolysis amperage automatically to keep alkaline levels consistent. 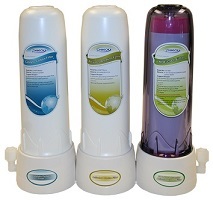 •The remaining water filter life will be auto-adjusted according to your water quality. •The LCD screen displays the remaining filter life, reminding you to change your filter when necessary. 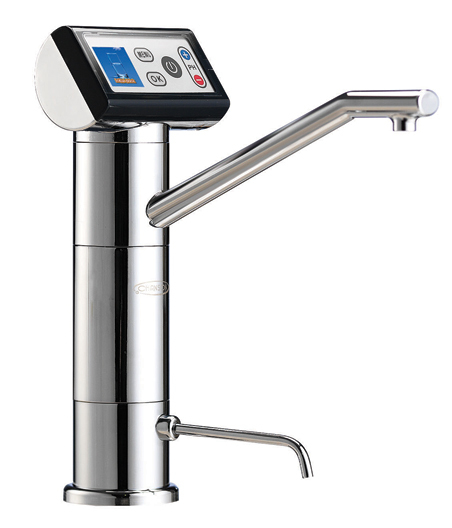 Chanson VS-70 will automatically set its cleaning cycles based on the mineral content of your water. Cleaning always occurs after you turn the machine off, this allows the machine to perform maintenance without ever interrupting your water usage. Chanson VS-70 will automatically go into a flushing cycle each time you turn on your ionizer. This is a wonderful feature for an under sink ionizer because it allows any standing water in the line to be flushed out before you drink. •Chanson Ionizers have an auto shut off at 20 minutes to prevent flooding in case left on by accident. The machine can be turned right back on if need be. The Chanson VS-70 has the least amount of acidic waste water of any brand ionizer. While there are many uses and benefits of the acidic water, often it just runs down the drain if not collected for use. 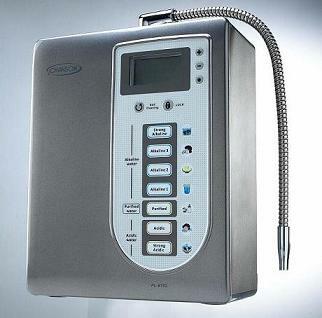 So for customers concerned with saving water, the Chanson VS-70 is a superior choice. pH test kit: This kit contains test tubes, reagent liquid and a pH color chart to help you understand the ionizer's performance so that you can be sure you are drinking the correct level of alkalinity. Fantastic Owner’s Manual: Our beautiful color manual is a great tool. Installation CD: Right in the box for your use. Online Installation Videos: Are available right on our web site. Most people can easily install their own ionizer after viewing our detailed installation videos. Installation kit: Our ionizer comes with everything you will need to perform a standard installation. Unique or custom installations may require extra parts and/or adapters which are conveniently available at most home improvement or hardware stores. Personal Service: If you have any questions about your ionizer's installation or performance we are just a phone call away. Call our and select technical support. Seven (7) electrode of titanium nano platinum titanium. <>Flow rate detection and heat sensor to prevent excessive usage. Alarm message in case of low flux. Alarm message and ionization disabled during hot water inflow. <>262K color 1.1" TFT LCD Screen display filter life, PH-value, clock, time, over-heated water temperature alarm and malfunction alarm. <>Use Silver-adding Fiber Activated Carbon Filter (Lead reduction): remove lead ions from old pipes and silver-adding which is an anti-bacteria element..
<>Intellectual LOCK keypad: Micro-adjust and PH-value locked to prevent kids and older adults mistakable drinking the wrong setting of ph water. <>Easily change the filter cartridge from left of the ionizer case. 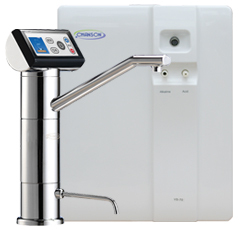 <>Comes with pH testing solution and color chart so that you can test your tap water, any bottled or filtered waters that you are currently drinking and all levels of water coming from your new Chanson Alkaline Water Ionizer. You will see for yourself the amazing change in your water after it passes through the ionizer plates. <>Reduced mineral deposits using Self-Wash system. 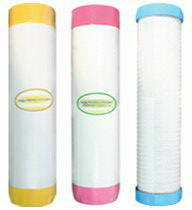 <>Filtration of diverse pollutants and microorganisms using high-quality filter.